Luck, Karma after all these years, I still don't know if they exist. Well Joyce the trick is to wait...and wait...and wait. I totally share your sentiments!! lol Nice 4 leaf clover, though! I think thats what we have to do too, is make our own luck!! That's cool that you found a 4 leaf clover. Sorry it's not bringing you luck. Maybe it's a defective one. Bah ha ha I totally feel ya on that, Joyce! That is interesting. A lot of good luck to you whether it comes on its own or you make it Joyce! :)Thanks for hosting. Yes. I agree. We all have to create our own luck. Have a great day. I suggest making your own four-leaf clovers, too. I was never a lucky one. Maybe.. maybe just one day, the gods of luck will smile on me!!! Ha! Well, at least you have an interesting clover to show for it. We found a bunch of four leaf clovers outside this past summer and dried them for the boys. So true though - make your own good luck! Sending you MORE GOOD LUCK!!! lol. I could certainly use some luck!! I think it'd be so neat to find one, just because they're so hard to come across! Sending you luck and many blessings, Joyce. If I am sitting in the grass I will often look for 4 leafed clover...but, alas, no luck even finding the luck! Maybe you should play Powerball. It's up to 245 million! Clovers are cool, but I wouldn't bet on them. When you left expected that when it will happen... But yes, remember not to leave it all to luck we can help the odds. Thank you for linking to our Wordless Wednesday Hop @CraftySpices, wish you a great rest of the week. 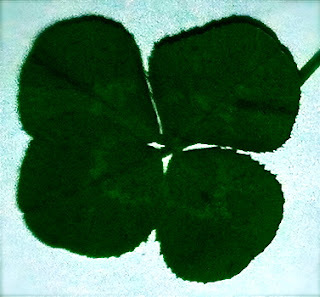 I have never found one and boy to I have a story about a four leaf clover that would make you understand my aversion to the whole "Good Luck" thing. That is a great find! Lovely pic of it. Ah bummer....and after all the trouble of actually finding such a rare thing too. I feel ya... the end of a rainbow once landed in our backyard, but alas -- no pot of gold.